Immunogen: Purified calf thymus poly(ADP-ribose) polymerase (PARP). Specificity: Recognizes an epitope in the C-terminal part of the DNA binding domain of PARP. Crossreactivity: Does not cross-react with chicken PARP. 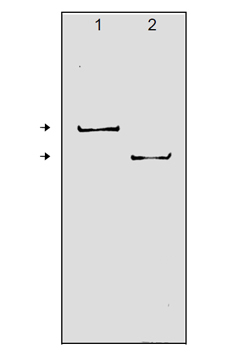 Application Notes: Detects bands ~116kDa (intact PARP) and ~85kDa (apoptosis-induced cleavage fragment) by Western blot. Formulation: Liquid. Mouse ascites containing 0.02% sodium azide.